There exists a high number of standing armlocks in Chinese Chin-na and in other martial arts. Some are quite popular. However, most of them are not very practical. 1) Opponent's focus joint must be moved into its limit position; so that it gives out pain. It is the pain the moves the opponent. No pain=no effect. 2) The rest of opponent's body must be moved into such a position and angle that the reactive forces caused by pain from the locked joint affect his COG(center of gravity). 3) It doesn't matter if the you want to use the joint lock to break or to control;conditions 1 a 2 must hold during the whole execution of the technique, to allow you to keep him off ballance, or to break the locked joint. Now realize that the conditions are dynamic. The opponent is moving all the time, trying to dissolve your angles; you must move with him and prevent it. You must be able to continously maintain the angles at all joints(2), and the limit position on the focus joint to cause pain(1). The moment one joint in the chain gets out of position, the whole technique fails. This is why it is relatively easy to get out of a lock after a while; and why it is so hard to hold somebody in a lock for a longer time. Let me sum it up: Standing arm locks are lousy techniques, because in order to succeed, they require the fighter to continuously apply force, over a precise trajectory, in always changing, but always precise angle, at one single point. Simply put, most armlock are so difficult techniques that in order to apply it, your skill or force level has to far exceed that of your enemy. Most people do not realize that because they are not used to think about their techniques; they are used to do what they are told to do. But looking at people who are learning locking techniques,you will see that most of them have trouble using them on cooperative adversary. In real fight, where the opponent resists and is able to change the angle constantly, it is a lot worse. By that I do not say that armlocks are impossible to apply; only that in order to apply them successfully, you have to have a great advantage(be it in skills,force etc) over your opponent; far greater than in order to apply a strike or throw. Most people only succeed in applying armlocks by using a combination of surprise, brute force and pain; and sometimes only because their locks tend to throw the opponent to the ground, thus changing them into a hold (See below). Here is the realm of 'drunken uncles' and the police handcuffing protesters: If the opponent is too drunk or does not actually want to fight (or you hit him over his head with a stick), you can place him in a lock with relative ease. (However truly speaking, this is precisely what you shouldn't do; as you can inadvertedly damage the locked joint). But is this optimal? Definitely not. That leads us to the conclusion that classic standing armlocks, per se, are lousy fighting techniques; in other words, return-of-investment, in the terms of time and skill needed, versus the probable effect, is bad. So why people use standing joint locks, you might ask? The answer, as in many similar cases, is simple: Because they do not know better. Most people use the terms 'locks' and 'holds' interchangably; and do not actually distinguish between them. That is a bad thing. Because locks and holds are essentially different; to put it bluntly, holds are good, locks are bad. A. Lock is a technique principle of which is getting opponent's joint into a limit position, and controling his whole body(his COG) by the means of that locked joint. That means, the joint has to be in the limit position, causing pain, all the time. B. 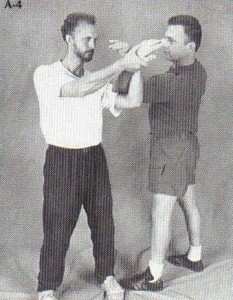 On the contrary, Hold a technique where the fighter is attached to the opponent directly, and controlls his ballance(COG) directly, without intermediate locked joint(s). For example, bearhug is a hold; thai clinch is a hold. Here the key principle is not pain, but keeping the opponent off ballance by pushing and pulling. Holds are, by their nature, a lot easier to apply and maintain; as they do not require a precise angle to be kept all the time. You are, in principle 'hanging on the opponent', and controlling his COG(his ballance) using pushing and pulling. There is no need to keep some joint locked, or using pain to move the opponent. I repeat: Holds are a lot easier to apply and maintain than locks. For an empiric proof, look at MMA fights, where holds(clinches) are commonplace, but (standing) joint locks are rare or nonexistent. We will get to that later. However, holds have one disadvantage - they cannot be used to directly incapacitate the opponent. In fighting, they are mostly used to position the opponent for striking (thai clinch) or to take him down (baiana, leg block, what have you). Interestingly, there exists a group of techniques that are combinations of hold and lock; the locks of the groundfighting. Here, the opponent is pinned to the ground (=hold); and while he is being controlled by the pin, his joint is locked(=lock). The straight armbar, the top wrist lock, etc - all of them are combinations of hold and lock. Note that the lock is not required to control the opponnent! He is sufficiently controlled by the hold(pin). The magic of ground locks is that they allow you to break(lock) the joint while you are controlling the opponent with the hold. It is precisely this principle that makes ground locks so high-percentage techniques that they can be reliably used in the highly dynamic environment of MMA. That they HOLD and LOCK at the same time; the opponent is controlled by the more reliable hold, while his body is damaged by the less reliable lock. Most groundfighting locks are holdlocks; that makes them so reliable. Interestingly,there are a few techniques combining hold and lock (holdlocks) that can be applied standing. These are probably the most reliable standing "locks" (in fact, holdlocks). For example, Tony Cecchine, in his Snap no tap series, shows how you can use 'Double wristlock' as a come-along hold. Watch the principles in action: The opponent's arm joints are not locked per se; Tony only uses the twisted arm to pull and move the opponent around in his unbalanced positions. The moment he wants to apply pain, he adds the forearm locks(or shoulder lock). But what is important that what controls the opponnent is not the joint pain; it is the HOLD. Similarly, Fig-4 choke can be used as come along. 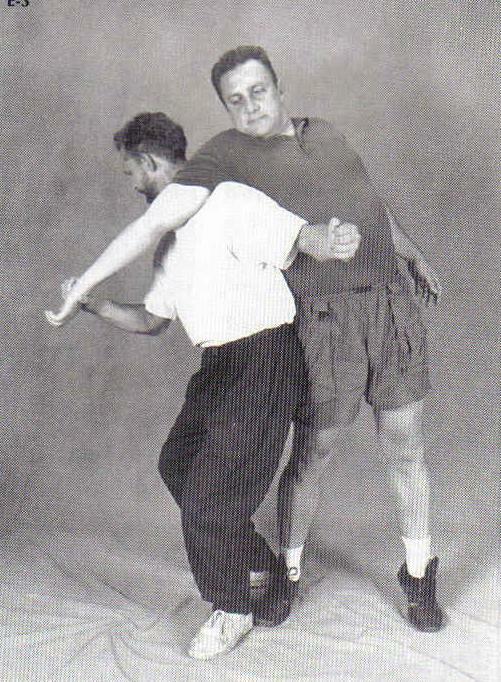 Again, the principle is the same: The frame is only used to keep the opponnent off ballance(hold); until the need to squeeze his neck arrises(lock). It is the fact that the controlling principle is a hold that makes these techniques so reliable. If you want to control the opponent reliably, use holds, not locks. If you want to reliably apply a lock, first control the opponent with a hold. This is a typical lock. Note that the only thing that keeps the opponent still is the pain in his wrist and elbow. If he manages to straighten his arm a bit, he is out. Another typical lock. The whole technique relies on keeping the elbow joint hyperextended. If the opponent manages to bend or turn his elbow a bit, he is out. Or he breaks his own elbow when struggling. Neither extreme is optimal. Yet another lock. Bend the elbow, you are out. The more time you spend there, the more probable is that the opponent will twist out of it. 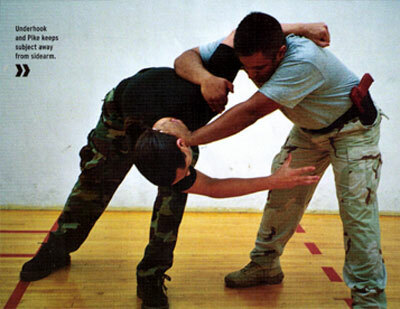 'Underhook and pike' from ISR Matrix. This is a hold. It doesn't rely on any joint being kept locked. (Note: Wrestling's underhooks and overhooks are, by themselves, holds). The difference from the previous techniques is essential (ie different in nature, not accidental). Top wristlock. This is a combination of hold and lock. 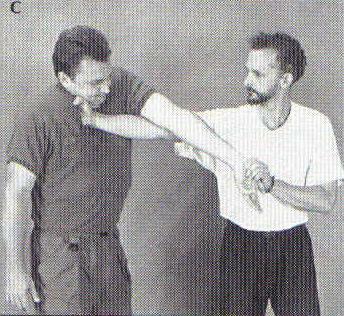 Note that even if the lock on the shoulder joint fails, the opponent is still safely controlled with the pin(hold). Now imagine doing the lock without the hold - that would be ridiculous. However, that is precisely what most standing joint locks try to do. Let me return to one of the main messages of this article: Standing locks - meaning, majority of locks taught in martial arts - are lousy techniques. Meaning that in order to apply them successfully, you have to have a huge advantage of skill(or force,or pain,or surprise etc) over your opponent. Now people will ask - if it is so, how come traditional styles are full of such a techniques? As one who studied Chinese Chin-na (ie standing locks) in detail and for quite some time, I think I can try to give you an answer. First, Chinese martial artists were very skilled fighters, that cannot be denied. However, the process of teaching, and passing information in general in kungfu, leaves a lot to be desired. Chinese masters often withold information, use the sink-or-swim teaching method, do not explain what they are teaching. Often, the crucial informations are only reserved for their most trusted students. Couple that with a lack of sparring and a culture that puts great emphasis on not questioning tradition, and you have the information passing model common in kungfu. Second, kung-fu masters often apply the philosophy 'if the technique is lousy, beat him with skill'. They systematically trained their skill(kung) to such a high level that it did not matter to them if their techniques were crap. They could beat most people using pure skill. To illustrate this, let me share an anecdote: I saw a documentary about a chinese kung-fu master who trained his arms daily for long years to such an extent that he was able to crush river rocks with his bare hands. Now, this is certainly a high level of skill(kung). However, when we look at it rationally - what is this good for? Yes, if he strikes you, he will probably kill you. But isn't it better to use a hammer to crush rocks, and weapons to kill people? You see, the long, arduous training regimen of the man, when viewed rationally, is to certain extent silly. Imagine him facing a western boxer. The boxer would probably be able to out-box him. However, if the kung-fu man hit the boxer once, he'd probably hurt him bad. And that is not the only example. Kungfu is full of iron bodies, iron forearms, iron fingers etc; something western martial arts never bothered to develop. I guess there is a reason for that. In short, it seems to me that chinese(and oriental) fighters in general often hide their lousy techniques behind superior skills. What does that tell us about Chin-na locks? Well, I guess if you trained for 30 years, and had an excellent command of rooting, footwork skills, iron fingers etc., it would be easy to catch untrained people in a Chin-na lock. But if you do not have any of the above, you are pretty much screwed. However, as a student of Chinese martial arts, you cannot say that aloud; you have to train and train and hope someday you will be skilled enough to apply the 'traditional' techniques. The result? In the eastern model, lousy techniques are kept. Western martial arts use a different approach. The techniques are supposed to work right out of the box; they are not expected to take ridiculous amount of time and energy to develop. This is further augmented by early inclusion of sparring - sparring not with laymen, but with your peers(skills-wise). This discourages the use of techniques that work only against considerably less skilled adversary. The result? In the western model, lousy techniques are quickly eradicated; only reliable ones remain. Chinese martial arts work under the model of fighting a considerably less skilled adversary. Western martial arts work under the model of fighting an adversary of approximately the same skill. This naturally shapes their techniques differently. An art that routinely expects an equally skilled adversary will generally have much more evolved techniques. Let me use another example. 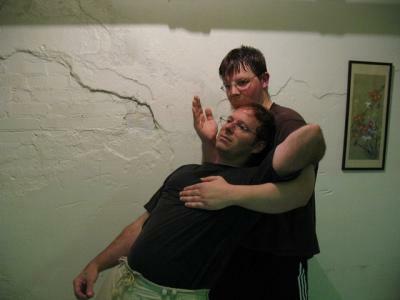 In Chin-na, there are techniques where you squeeze and pull your opponent's muscles with your fingers, to tear them or cause incapacitating pain. Now I am sure that if I trained 'iron fingers' daily for 10 years, I would be a feared fighter among general populace: I would be able to grab people and cripple them instantly. Lay people, that is. If I faced an equally skilled fighter, my muscle tearing skills would be useless, and I'd probably have to revert to unskilled brawling. This is, I believe, why such a technique never surfaced in western wrestling. Because techniques that need 5 years advantage over your target to work are not viable when you are sparring against people who train the same length of time as you do. Muscle squeezing, while being a cool technique, is in some way silly, precisely because of that fact. So where does this particularly rambling excursus leave us? Traditional martial arts often hide their lousy techniques behind superior skills. Chinna techniques work only against the unskilled, because they were designed to work against the unskilled. Western wrestling techniques work against similarly skilled, because they were honed to work against similarly skilled.